If you are a mathematical genius, a love of logic, have problem solving skills with business awareness, good in communication and excellent in number crunching, think of a career as an actuary today. The actuarial profession gains a formal presence in 1848 after the Institute of Actuaries is established in London. In India, the Actuarial Society of India (ASI) is established in 1944 and included in the international governing body of actuaries, the International Actuarial Association (IAA), in 1979. Traditionally, the actuarial profession was limited to the insurance sector but now, it expands to other industries as well. A business professional, an actuary has an innate capability to analyse the risk possibilities of a financial activity and mitigate the involved risks. An actuary is mostly needed in the insurance sector and pension programs where the task is to use financial theories, statistics and mathematics to study uncertain future events. An actuary is a “part super-hero, part fortune-teller, part trusted advisor”, says BeAnActuary.org. To put it succinctly, any business necessitating management of financial risk requires the services of actuaries. Business segments like hospitals, employee benefits departments, investment firms, consulting firms, government departments and large corporations often hire actuaries. According to the USA Bureau of Labor Statistics (BLS), the actuary segment will see a 26% growth between 2012 and 2022, which is much higher than average. As the career scope improves, actuaries will be expected to handle the development, pricing, and evaluation of new insurance products, its risks and find ways to mitigate them. An actuarial professional in the USA earns an average annual pay of 93,680 USD (2012 data available from BLS) and the Indian counterpart with 10+ years of experience earns an average annual pay of 980,214 INR. Take a look at some statistics picked up from PayScale.com. 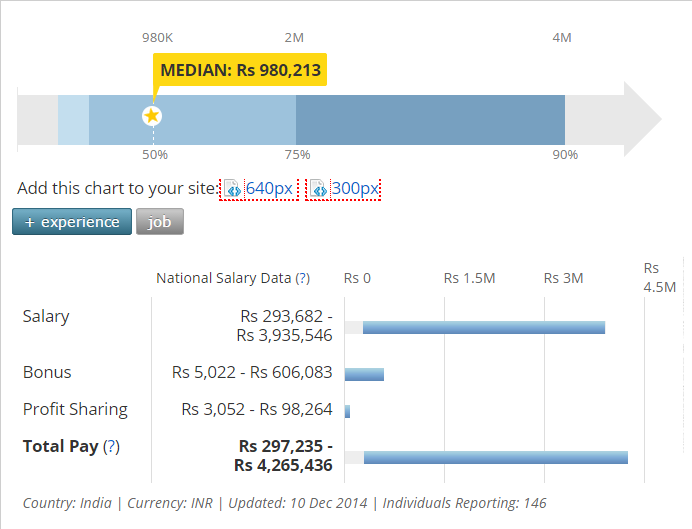 The screenshot above shows the minimum and maximum salary of an actuarial analyst. 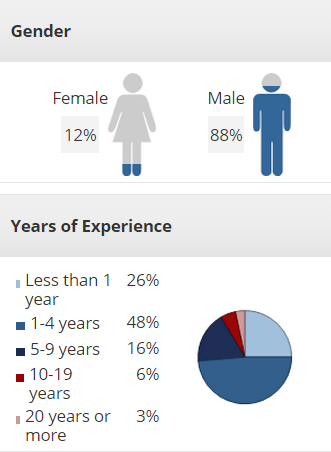 The second graph shows the gender divide; more men work as an actuary than women; one to four years is the highest years of experienced actuarial analysts employed in an organisation. The third graph above represents the breakdown of industries hiring the service of actuaries, according to BLS 2012 data. It shows that the professional presence is deeply entrenched within the insurance industry. As an actuary, you have to use mathematical equations, statistics, and financial theories to determine the risk and uncertainty of involved financial costs. You have to assess risks and help the company to take measures to minimize the risk. There is a high dependence on computer data modeling software, such as advanced financial modeling and statistics software to crunch data in a short span of time. Such advanced software helps to understand event probability and undertake cost forecasting. You have to work within a team, which usually comprises of accountants, analysts, and underwriters. Accountants help to determine the price of insurance products while analysts help to understand market demand. Underwriters accomplish product formalities. collect and collate relevant statistical data for further study and analysis. analyze the events and its risks that can increase the economic costs for the company; for instance, untimely death or a natural disaster will cause an insurance company to pay the insurance amount to the nominee and this pre-mature payment can cause losses to the insurance company. design, test and implement various business strategies like pension plans and insurance investments to maximize profit and minimize losses. The actuary has to create in-depth reports containing charts and tables to explain the business strategies and its benefits. explain the report/s to the shareholders like clients, executives and government officials. When you gain higher experience, you are given supervisory roles. As an actuarial supervisor, you will be expected to advise the senior management, delegate tasks to your team and testify on proposed laws and regulations in front of the public. If we talk about the insurance sector specifically, there are four types of actuaries that you can find there. The four types are briefly explained. 1) Life Insurance Actuaries: The work involves analyzing the life expectancy of a person based on high-risk factors like current age, health status, and gender. Based on this analysis, insurance programs are developed for individuals and groups. 2) Health Insurance Actuaries: The work involves analyzing the life expectancy of a person solely based on the person’s current medical health, past health records, genetic history, occupation and geographic location. All these factors determine the expected cost of a promised health policy and cost of the organization for policy adherence towards short-term and long-term medical expenses. 3) Pension and Retirement Actuaries: The profile involves assessing and evaluating the existing pension plans and derives future pension plans, and determines whether the company will possess sufficient funds in future to pay off employee pensions and other retirement benefits. Sometimes, you also need to advise individuals to best utilize their retirement money. 4) Property and Casualty Insurance Actuaries: The work involves analyzing the life expectancy of a person against the potential of injury and/or death due to automobile accidents. Factors like driving history, gender, age and car type factor here. As an actuary, you also have to develop insurance policies to ensure people against property losses due to untoward events and natural disasters like fires. Education, interest, knowledge, and experience will help you to choose which type of actuary you want to become. Experienced actuaries also have the option to act as consultants for industries other than the industry sector, provided they have an excellent understanding of that industry and its business components. Educationally, the basic requirement is to be a mathematics, statistics, finance or actuarial science graduate. Actuarial science courses are offered at selected institutions in India. They are listed below. If you find more, let us know and we will update the list. 1. Haryana Engineering College, Jagadhri, Haryana. 2. Christ University, Bangalore, Karnataka. 3. Bishop Herber College, Trichy, Tamil Nadu. 4. Ernakulam Insurance Institute, Ernakulam, Kerala. 5. The National Insurance Academy, Pune, Maharashtra. 6. College Of Insurance, Mumbai, Maharashtra. 7. Insurance Training Centre, Kolkata, West Bengal. 8. Directorate of Distance Education, Karikudy, Tamil Nadu. 9. College Of Vocational Studies, New Delhi. 10. Tolami Institute Of Management Studies, Adupur, Gujarat. 11. Kalyani University, Nadia District, West Bengal. 12. Shri Vile Parle Kelavani Mandals Narsee Monjee Institute of Management Studies, Mumbai, Maharashtra. 13. Institute of Actuaries of India, Mumbai, Maharashtra. 14. D.S Actuarial Education Services, Mumbai, Maharashtra. 15. Amity School of Insurance and Actuarial Sciences, Noida, Uttar Pradesh. If you want to study abroad in countries like South Africa, USA, Egypt, Canada, China, England, New Zealand, Australia, United Kingdom and others, here’s the updated list of actuarial sciences schools and colleges. The graduation degree will let you begin as an actuarial career as a “trainee” only. You will be assigned teams comprised of experienced actuaries. As a trainee, you have to spend time working on various departments like underwriting and marketing to understand how actuarial work happens. To climb the next step and get better career opportunities, you need licenses and certifications. Often, your trainee company will support throughout the certification process by sponsoring study materials and/or covering the examination cost. Bonuses and salary raises are even offered with each certification exam passed. 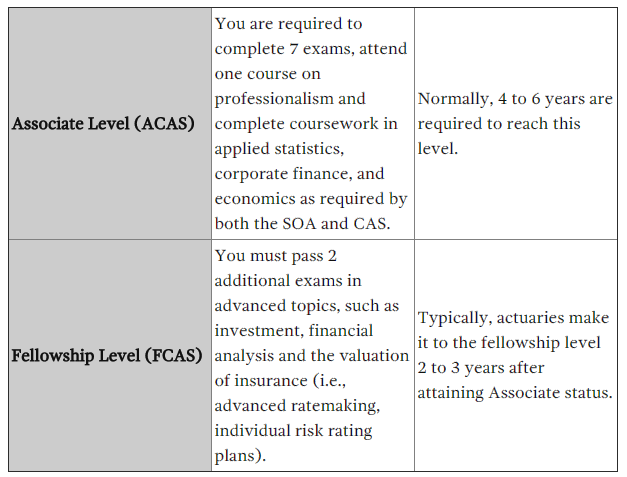 The Society of Actuaries (SOA) and the Casualty Actuarial Society (CAS) are the two professional societies handling the task of granting “professional status” to trainee actuarial. 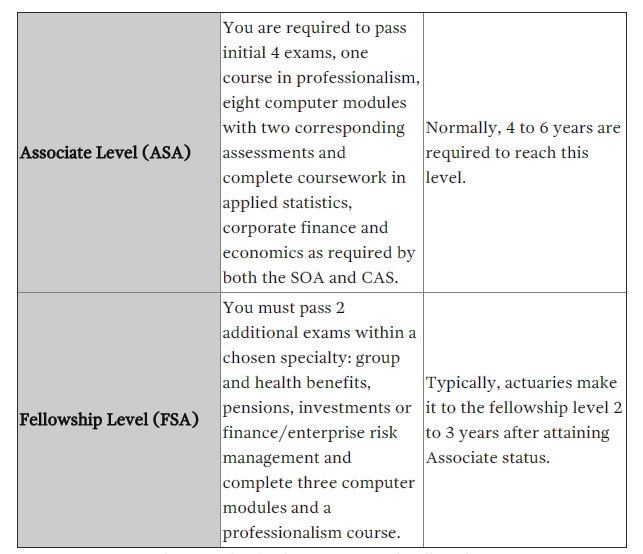 Both the SOA and CAS grants “associate” and “fellowship” statuses on clearing specific examinations. Pursue SOA certification if you want to go into retirement benefits, finance, investments, health insurance and life insurance. Pursue CAS certification if you want to go into medical malpractice, automobile insurance, property and casualty and workers’ compensation insurance. There are five exams in SOA and seven exams in CAS. Clearing SOA and CAS will give associate certification, ASA, and ACAS respectively. Getting the ASA or ACAS certification takes about four to six years. Each exam takes months of preparation. Another two to three years are involved in moving from “associate” to “fellowship” status. Group and health benefits, investments, retirement benefits, life and annuities and enterprise risk management are SOA fellowship options; specific options don’t exist for CAS. To remain associated with either SOA or CAS, you have to keep attending their professional seminars, both online and offline. It is mandatory and employers to make provisions for this. You need to be analytical skills, problem solving skills, math skills, computer skills, interpersonal skills and communication skills to get actuarial certifications. You need to be dedicated, committed and hardworking to become a certified actuary. You need to invest almost a decade to go from being a “trainee” to a “fellow”. If you want to enter a specific financial career involving risk analysis and excellent future growth potentials, take up actuary as a career. Hit us with questions/doubts, if you have any. Like can we do actuarial after B. Com ????? Please visit the websites of the colleges mentioned here and select the one based on your location, eligibility criteria, fees, industry interface, and faculty. should I focus on my final year or start with Actuarial Science ? Thanks for the above information ! First of all thanks for the article. My interests exactly match with those you have listed in the beginning. Currently I am a circuit design engineer with 3 yrs of experience after having graduated from BE. My salary is close to 9LPA. Will it be worth to switch to actuarial career after so many hardships? Is there anything called as part-time in this career? so that I can use that to shift my focus gradually from my current profile. Your suggestions please? Yes. You can start by giving your speaking services at colleges. I am currently doing my graduation in bsc computer maths and statistics. Can i persue acturial science after completion of my graduation?how much time would it take and what are carrier options? I am a CA.. and I wanted to ask that if I wanted to join this course when will my training be started? Please contact the institutes mentioned in the guide. Would it be better to do a CFA or actuary ? But Can you suggest me where to do best Actuary In Mumbai? The best thing is to contact the institute directly. If I were you, I would visit the institute, talk to alumni, talk to professors, check the infrastructure, and take a decision. I’m currently working as a Senior Software Engineer in an IT company. I’m interested in learning economics and risk management. Please let me know how to start the preparation and how long will it take to complete the course. Currently I’m earning 8 Lakh per Annum and would grow at least 20% per an year. How would be the career professionally and financially. Please help me. can an actuary work as a financial risk analyst? if yes then what would be the growth? Yes. Growth depends on the candidate, company and the market. Is growth in finance sector as good as in insurance sector? Whose growth? How do you define the growth? nope. i am a ca final student but i want to study farther even after becoming ca and i thought about two course i.e FRM and Actuary. i don’t which one to go for. Will write a detailed article on this. What would you want to be covered in the article? Please give some pointers. i just want to know how an actuary work as a financial risk analyst or investment analyst? and if the growth rate is same as in insurance sector? and role of FRM and Actuary in investment banking and banking. Thank you so muchfor such elaborative article on actuarial science. Sir,i’m a commerce graduate &i wanted to know which postgraduate degree can be pursued while doing actuarial science, isMA in economics a good option or should we go for a PG in maths? and will having a postgraduate degree affect our job prospects in this field? I suggest you to focus on actuarial science only. What is the eligibility of doing this course.?? Am i eligible for this course?? You should be. Please contact the institutes directly mentioned in this guide. I am currently working in product control division of an investment bank. I have interest in understanding mathematics behind the scenes of a day to day pnl generation of swaps, futures, bonds etc. I am deeply confused on my career path, and would like to seek your advice on the way ahead. I am 30 now and at a very average salary compared to my peers ( I am a Btech from DAIICT ). I did try for MBA at an eArlier stage and had calls from FMS, NMIMS, JBIMs but could not crack the interviews. Looking at your post, I see it will take at least 10 years to become a certified actuary. Would it be worthwhile going for this, and can you please share market salary for people at associate and fellowship levels. One basic question, and I fact the most important one, am I eligible for pursuing actuary, with my background being engineering. Sorry for making the post long, but need some serious advice. Yes, you’re eligible to register for Actuary. Did you read the article from start to the end? You’ll find answers to your queries in the article.